Its obvious right? Ok but before you read on, say the answer to yourself. Is it because he is the most able to make up any lost time by the earlier teammates? Because in the anchor leg you know exactly what needs to be done? Now what about this argument: The total time is just the sum of the individual times. So it doesn’t matter what order they swim in. That would be true if everyone was swimming (running, potato-sacking, etc.) as fast as they could. But it is universally accepted strategy to put the fastest last. If you advocate this strategy you are assuming that not everyone is swimming as fast as they can. For example, take the argument that in the anchor leg you know exactly what needs to be done. Inherent in this argument is the view that swimmers swim just fast enough to get the job done. But even so its not obvious why this by itself is an argument for putting the fastest last. So let’s think it through. Suppose the relay has two legs. The guy who goes first knows how much of an advantage the opposing team has in the anchor leg and therefore doesn’t he know the amount by which he has to beat the opponent in the opening leg? No, for two reasons. First, at best he can know the average gap he needs to finish with. But the anchor leg opponent might have an unusually good swim (or the anchor teammate might have a bad one.) Without knowing how that will turn out, the opening leg swimmer trades off additional effort in return for winning against better and better (correspondingly less and less likely) possible performance by the anchor opponent. He correctly discounts the unlikely event that the anchor opponent has a very good race, but if he knew that was going to happen he would swim faster. The other reason is similar. You can’t see behind you (or at least your rear-ward view is severely limited.) The opening leg swimmer can only know that he is ahead of his opponent, but not by how much. If his goal is to beat the opening leg opponent by a certain distance, he can only hope to do this on average. He would like to swim faster when the opening leg opponent is behind but doing better than average. The anchor swimmer sees the gap when he takes over. Again he has more information. There is still one step missing in the argument. Why is it the fastest swimmer who makes best use of the information? Because he can swim faster right? It’s not that simple and indeed we need an assumption about what is implied by being “the fastest.” Consider a couple more examples. Suppose the team consists of one swimmer who has only one speed and it is very fast and another swimmer who has two speeds, both slower than his teammate. In this case you want the slower swimmer to swim with more information. Because in this case the faster swimmer can make no use of it. For another example, suppose that the two teammates have the same two speeds but the first teammate finds it takes less effort to jump into the higher gear. Then here again you want the second swimmer to anchor. But this time it is because he gets the greater incentive boost. You just tell the first swimmer to swim at top speed and you rely on the “spirit of competition” to kick the second swimmer into high gear when he’s behind. More generally, in order for it to be optimal to put the fastest swimmer in the anchor leg it must be that faster also means a greater range of speeds and correspondingly more effort to reach the upper end of that range. The anchor swimmer should be the team’s top under-achiever. In a swimming relay with 4 teammates why is it conventional strategy to put the slowest swimmer third? I find the idea that an olympic swimmer would ever give less than his maximum effort implausible, and am therefore skeptical of these motivational explanations. However, it might be possible for one swimmer deliberately swim in a more (or less) risky manner, and this adjustable-variance swimmer should go last (I have no idea how high-risk swimming would actually work). Alternatively, when I watch swimming, I often hear that swimmers are hugging the lane line in attempt to draft off of the leader, which presents another possible explanation. 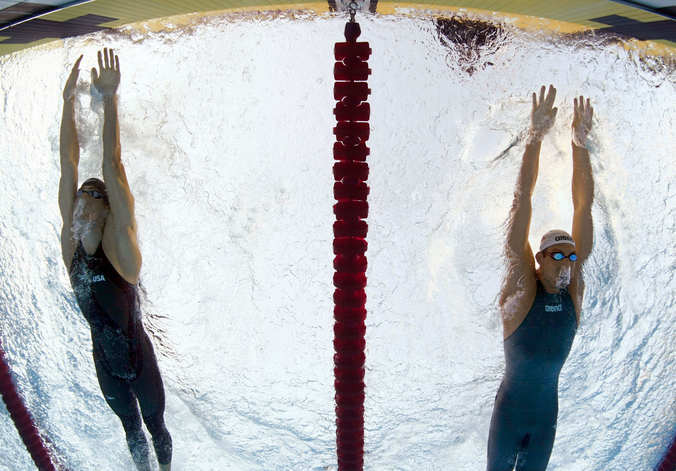 Hypothetically, if two relay teams had identical sets of four swimmers, and the difference in overall time were determined by how much a team managed to draft, it would be a dominant strategy to order your swimmers from slowest to fastest; otherwise, the other team would be able to fall behind and draft, only to catch up and pass you later. One other thing: I guess every team has a couple of average swimmers but the good teams have one or two stars. Even if all swimmers always swim their typical time (no matter what), you should have the star swimming last to please the crowd: The race stays tight until the end and everyone is looking forward a long time for the star. Suppose speeds are fixed and given the current speeds, you lose by a small margin. If you go fastest to slowest, you lead the race and lose it in the last leg. The other way around, you mount a heroic catch-up effort that just fails. Surely that is preferable. Considering the star-theory: putting lesser swimmers before them might be extra motivating (can’t let the star down) although that might also work the other way around (can’t squander the star’s lead). Here is my take as a former college swimmer. There are only 2 logical places to put the fastest swimmer: first or last. The reason to put the fastest first has to do with the start. In the case that your fastest swimmer has the best “flat start,” they should go first to overcome the disadvantage that the first swimmer faces (the relay start is about .5 – .7 seconds faster than a flat start, sometimes more). Now, suppose that your best swimmer is not your best flat-starter. Why should they go last? Hypothetically, suppose that two teams have 3 swimmers each with identical speeds and a fourth that is faster, but equal to his counterpart. If one team puts their faster swimmer last and the other makes a different choice, the first team would theoretically win every time despite being exactly the same. The best swimmers have a team based motivation to coast. They are more likely to have upcoming events. They also might be excused from participation in the relay preliminaries when those exist for similar reasons. Sports teams trade margin of victory for surety of victory when leading and I would expect swimming teams to trade margin of victory in one race for margin of victory in another closer race. Who contributes the most to the win? Times are additive, so presumably it is the fastest (perhaps not if the talent distribution falls off a cliff after the number of racers). To get the fastest to participate in a race with the other three, they must offer some sort of compensation for his higher marginal product. The fastest has other objectives such as winning this particular race. As Dan mentioned, that could include winning other races at the event. I would also mention they probably stand to gain the most in endorsements and publicity. Receiving the glory and publicity of crossing the finish line first plus the option of not going all out if the race is close to decided by the last leg is an attractive compensation package. Another argument in favor or the best freestyle relay racer going last. IM -Which has the order: butterfly backstroke breast free. If your best freestyler is the best relay freestyler on the team they will anchor the IM relay by definition of order. ( failure to do correct order can DQ a team) Thus the teams best freestyle relay person will be used to going last and have learnt skills that play to that. Additionally, a last second sprint in a relay at the 4th possition is good. In the 1,2,3, position last second changes in speed matter less as the person diving in next might not be as able to react as well. In the freestlye IM the last person being the star used to judging their start based on the breaststroke Medley IM swimmer ( ie a slower stoke) is best judging the speed of the slowest freestyler as they are used to slower starts. One thing to remember is that sporting events are largely about entertainment, and a tight race is more entertaining than one with a foregone conclusion. This could be the reason to put the slowest swimmer third – it all comes down to the last leg, which makes for a more exciting finish. While individual races are not won based on how exciting they are, sports, as a whole, live and fall by the interest of participants and audience. Several people have mentioned drafting and flat vs. relay starts. These are important points, but they have already been discussed. The key point that people are missing is risk. In swimming, races longer than 50m require pacing. Also, no one, not even the swimmers themselves, have “perfect” information on their optimal pacing strategy at the beginning of a race. So you put the best swimmer last, because they can bare the risk of “going out too fast” (racing too fast at the start of the race) at a lower cost than the other team members. In other words, if you are behind, the best swimmer can swim faster at the beginning of the race in order to catch up. Swimmers pay the cost of going out too fast at the end of the race. The best swimmer can hold-on better than his teammates. Another way to put it is: the best swimmer has a higher potential reward at a fixed level of risk than do his teammates. Along the lines of what others have said, I think being the fastest has its incentives. Assuming the swimmers are all competitive people, shouldn’t the internal competition to be the fastest swimmer provide enough motivation for the 3 slower swimmers to swim their fastest? The anchor is already recognized as fastest so he/she may not feel this incentive anymore. Hence, the race itself provides the additional incentive to the last swimmer to swim hard when the situation requires them to. Also, wouldn’t the backstroke be the first leg of the IM since you have to start in the pool for that one? I am surprised by the number of people who believe olympic athletes are immune from competition juicing their performance so to speak. Cognitively, even if it’s not conscious, it is the rare human that can have the same performance if they are against a lower quality of competition. I have another theory that hasn’t been discussed (for a freestyle relay). Perhaps your faster swimmer has an increased confidence that he can overcome a gap regardless of who he is swimming against. If he’s behind, he will push himself to catch up, he doesn’t have doubt as to his ability to overcome the gap. A lesser competitor sees the gap, and believes that there is x percentage that he won’t be able to overcome the gap, and he starts rationing his effort, swimming for silver or bronze, because he knows that if he goes too hard initially to overcome the gap, he will fail and be passed at the end. If a competitor has perfect pacing every time, this would never be a worry, he would swim the optimal pace, but often a peak performance happens when a competitor exceeds his initial perfect pace, and is able to hold this new level. The cognitive component can be seen in another sport, golf. When tiger woods is in the field (we’ll see what happens now that his aura of invincibility has been shattered) the field shoots, on average 2 shots worse. For better or worse, the assessment of how you compare to your competition affects how you perform – amateur or professional, B-team or olympics. I think a similar question is why so many world records are set at the Olympics? Tougher competition makes the elite athletes push themselves more. So you want the best swimmer going in the last leg, since he or she is most capable of pushing beyond his or her previous performance in order to overcome a deficit. You’d think with your life on the line, you would always draw your gun as fast as you can. But no, you usually draw your fastest when you’re behind. 2. Yourt fastest swimmer will swim faster by a greater absolute amount than the other swimmers. Great post, Jeff! Although it is not immediately clear to me why your very last example is correct. Seems to depend on the interpretation of effort. What if the fastest swimmer is more likely to be able to implement a fast speed (i.e., at lower “effort”) and so it is optimal to give him the “information”. Dave’s draft-based Nash equilibrium is also convincing. How about this simpler explanation: The sole source of variation in speed is an extra oomph you can give when you’re behind. So ideally you want everyone to be behind as much as possible. So I think slowest-to-fastest is a dominant strategy. It maximizes the amount of time the swimmers are trailing. I think there is something to be said for the incentive and drafting argument. However, I believe the driving factor is in the risk hypothesis proposed. Athletes never perform at a constant level, their performance is a measure of probabilistic risk vs outcomes. Look at the best ball situation in golf. Would you rather have your best player go first or last? Typically they shoot last because if the first player hits a nice shot, they can “go for the green.” They have the best chance at hitting a spectacular shot when the probability of a negative outcome is reduced. In swimming, if the race is on the line and one swimmer has to kick it into overdrive, say going at 110% of their normal pace but having the risk of tiring out, you would want that 110% to be applied to your fastest swimmer. In this situation the risk of a negative outcome is reduced (the difference between going from second to first is greater than the reduction of second to third measured by glory, and even more so when looking at fourth to third and fourth to fifth). There is evidence in this when you consider that you almost never see the first swimmer lose steam but it is more common to see the final swimmer fade down the stretch due to fatigue. I swim, and almost everything said in the article is true to my experience. Especially about the anchor swimmer having to be the top under achiever. Of course, all these (very insightful) comments are really about teams with a legitimate chance to win, or at least place high, in the race. Suppose you coach one of the lower-ranked teams, just barely making the final. In that case it might be better to swim your fastest performers first & second, try to stay competitive for 2 legs, take advantage of some drafting, and maybe improve the psychology of the 3rd leg by keeping her close rather than completely out of it before she starts. I feel that it comes down to the psychological battle that is underlying in any race situation. There has become a standard format for events slower first and faster last, if you were swimming a race and the person you were against was exceptionally better and well and truly beating you this could effect the psychology of your race. Think of it as four separate races, each racer is in order of speed they will know that the person they will be racing against should be traveling at a similar speed. Being completely out matched can play a demoralising role on the loser in turn effecting their performance and this will effect the teams performance. However in saying this switching up the order could be an offensive strategy for a psychologically strong team. Five years late to this party: I think loss aversion is worth mentioning. It feels much worse to get the silver after leading most of the race than it does if you move up from a lower position. Especially with “fastest last” being the existing standard, I don’t think a coach could stand the reputation hit of using a different order and getting passed in the last lap, even if he would have lost anyway. For once, this psychological consideration might actually be aligned with the analytic considerations others have mentioned.